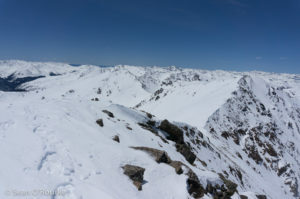 After a most un-Sawatch day (steep peaks, solid snow), I headed north to tag a couple high 13ers near Mount Elbert in more typical conditions. 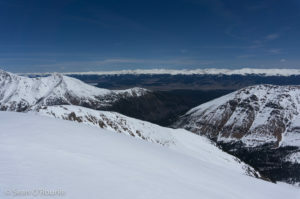 French and Casco are two ho-hum peaks overshadowed by neighboring Mounts Massive and Elbert, two of Colorado’s highest. They can be climbed via an old mine road leading to near 12,000′ in the basin northwest of Elbert. People were driving as far as the Mount Massive trailhead on Halfmoon Creek road, but I chickened out a mile or so short, worried about getting up a slushy hill on my afternoon return. With so much road-walking on the menu, I opted for running shoes and bread-bags instead of my permanently damp mountaineering boots. The road was an easy walk to where I turned off on the South Halfmoon fork and crossed Halfmoon Creek. I found a dry crossing after a bit of exploration, but noted unhappily that the snow was already soft enough to require snowshoes. 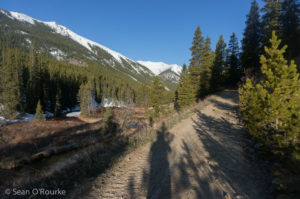 Once across the creek, I followed the road up into the basin, where it disappears into open willows, then continued toward what turned out to be the Casco-“Frasco” saddle. 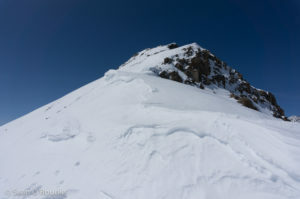 This is not the “right” way to climb these peaks, but spring snow is forgiving. After kicking my way up to the saddle, I made my way slowly up the obnoxious ridge to Casco. The wet snow conspired with a west crosswind to make my feet uncomfortably cold, so I spent 10 minutes on the sheltered side of the summit wringing out my socks and warming my feet inside my balaclava. Feet temporarily re-warmed, I awkwardly snowshoe-skidded back down, then headed for Frasco. My feet were once again uncomfortably cold, so I found a sheltered spot to again wring out my socks and try to re-rig the plastic bags to better protect my feet. I was tempted to just head down, but French was close enough for me to force myself to get it done. 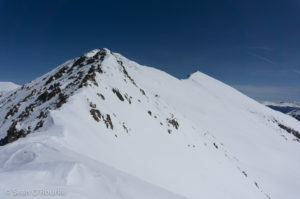 The ridge to “Frasco” was tricky, but became dramatically easier between there and French. I paused just long enough to take a few photos from the summit, then headed straight down the south slope to intersect my outward track. My snowshoes became too treacherous on the steep, softening slope, so I plunge-stepped down to near the Iron Mike Mine, then put my snowshoes back on to make my way through the woods to South Halfmoon Creek.